Open up a whole new world of adventure with adaptive mountain biking! 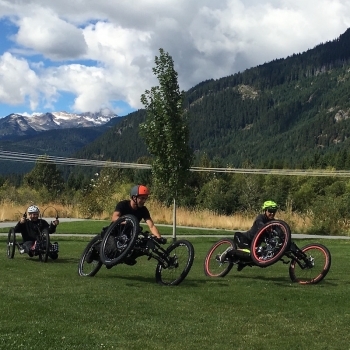 Based out of Whistler, British Columbia, the Whistler Adaptive Sports Program (WASP) offers an amazing variety of programs for people with physical and cognitive disabilities to access nature and participate in sport. As head mountain bike coach for the WASP summer mountain bike program since 2010, Sylvie Allen has inspired program participants to broaden their horizons. Sylvie is motivated by the delight of her students and hopes to further improve and develop the adaptive mountain biking (aMTB) program. Through the aMTB program, fun and approachable coached rides (group or private) are offered to locals and visitors with cognitive disabilities. Weekly rides tour the Lost Lake park and include other fun group activities in Whistler’s natural surroundings. On request, locals and visitors with physical disabilities or visual impairments can book the bikes and guiding services offered through WASP. New as of 2016, WASP has a small fleet of adaptive mountain bikes (aMTB) available for private or small group guiding. Our aMTB fleet offers a unique opportunity for locals and visitors who have limited mobility in their limbs resulting from spinal cord injuries. Our aMTB, bikes have electric hand pedalling assist motors, so riders can access more trails and climb hills with ease. 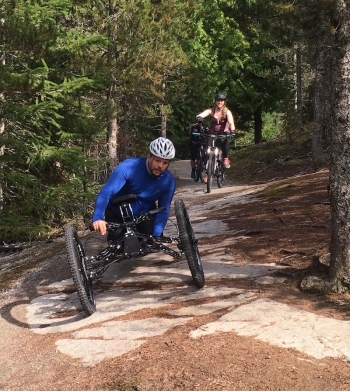 Accessing some of Whistler’s amazing views and trails has been impossible until the assistance of an electric motor on these adaptive bikes! Two aMTB models are available. The XCR aMTB offers a recumbent position, and is geared for a more relaxed ride on trails like the Whistler Valley Trail (paved) or Lost Lake’s Trails (crushed gravel). Optional Quad Handles, offer quadriplegic riders with limited hand strength the opportunity to pedal with confidence. The Explorer aMTB offers the rider a more aggressive forward position and higher clearance for Whistler’s technical trail network. With suspension on all 3 wheels and powerful seat suspension, this bike helps riders navigate bumpy terrain. The bikes can be adjusted to fit almost any size of rider. At this time, the WASP aMTB fleet is not suitable for the Whistler Blackcomb Bike Park. Not to worry though, the motors open opportunities for adventure without a need for the chairlift. In September, WASP is offering an aMTB camp for locals and tourists with disabilities. Sign up for the chance to try different bikes, learn a few new skills, explore the valley, and meet new friends. Book online with WASP to try out one of the aMTB bikes or sign up for our weekly ride and put a huge smile on your face!